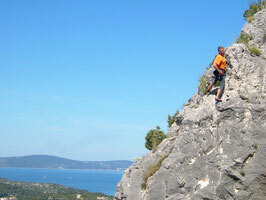 One week climbing and sailing on the west coast from Croatie. Climbing, sailing,swimming, hiking or just relaxing. A Dreamweek`s with lots of Action and Fun.!! Sailingboot, Insurance of the Boot, 3 Meals a day, 7 Night on the boot, Harbourfee, Tax for Croatia, Diesel, Gas, Skipper, Mountainguide, Endcleaning. 5-8 Guest`s. Trekking for the exclusive taste in one of the most beautiful territories of South America, Pantagonia, the land of endlessness. In its most southern part, we can find the Torres-del-Paine National Park and the Los-Glaciares National Park with the well known granite walls of Fitz Roy and Cerro Torre in the center. 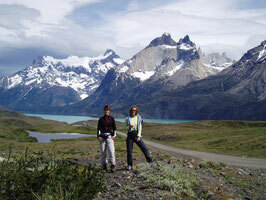 The trip around the Paine Massive has one of the most beautiful trekking routes. In the park, we will find guanacos, nandus and with a little luck a condor. Very good physical condition to master walks between 5 and 8 hours are required. In the Paine National Park, we are responsible to carry our own tents, group equipment and personal luggage for 2-3 days. Otherwise, locals will accompany us with their horses which will carry our luggage. Please ask for a detailed program of this trip. Our trips will take us to the old kingdom Marrakesch and the Desert City Quarzazate, a large oasis and trade center located in the South East of Marokko. It borders the Orient with its magic of Aladin, its impressive pompous building, golden mud towers and the endlessness of the Sahara. The groups will be escorted by a native guide and his helpers (cook, donkey-or camel keepers). The luggage will be carried by donkeys or camels. Good physical condition, capability to walk long distances, secure stepping and ability to adapt to local circumstances are required for this wonderful trip. At the end of the trip, we will be spending two nights each in Marrakesch or Quarzazate. An impressive city-guided tour will point out some of the most impressive buildings and sights of these old cities. Also we will accept the challenge to show off our bargaining skills in Souks to the Berbers. A: High Atlas Trekking with 4000 m climb. Trekking for the adventure seeking and nature loving that will appreciate the beauty of the High Atlas. Rugged mountain chains and deep gorges will give us a breath taking views. The high light of this trekking will be a climb to the M-Goun, 4,068 m. It is technically simple, but requires day excursions lasting 5-7 hours (M-Goun 8-10 hours). Camel trekking through the Northern Sahara. Dunes, oases, wonderful sun rises and deep dark nights with millions of stars will accompany us during this week. After an impressive drive through the Draan valley, the fright garden of Marokko, we will set up our tents in the Berber town called M’Hammid. After our first night in the dessert, we will go back and forth through the Sahara for the next six days to Foum Zguid. Walk and climb in Southern Marokko. Our tour starts in Zagora, the northern border of Sahara, and takes us past oases and palm trees towards the South. During the last four days, we will climb in the beautiful Todra Gore. Something for everybody: 180 good prepared routes between Level IV and VIII right next to our hotel. Short one-rope-length tours or 300 m long day excursions in the brown, horizontal calcium. As rope-second, you should be able to climb at Level IV to V.
·Flight Genf-Casablanca-Marrakesch/Quarzazate – round trip. ·Trekking depending on program including lodging in tents or simple accommodations including all meals. ·All transportation (Bus, Landrover, donkeys, camels). ·Cook, animal keeper and local guide. ·3 nights in a good hotel in Marrakesch or Quarzazate, double occupancy room including breakfast. ·½ day city sightseeing in Marrakesch or Quarzazate. ·Transfer from and back to the airport. Please ask for detailed program.